Angelini, R. & Moloney, C. L. Fisheries, Ecology and Modelling: an historical perspective. Pan-American Journal of Aquatic Sciences, 2(2): 75-85. Download PDF file (134 Kb). Jablonski, S. The Brazilian sardine. Is there any room for modelling?. Pan-American Journal of Aquatic Sciences, 2(2): 86-93. Download PDF file (84 Kb). Paes, E. T. & Moraes, L. E. A new hypothesis on the influence of the El Ni�o/La Ni�a upon the biological productivity, ecology and fisheries of the Southern Brazilian Bight. Pan-American Journal of Aquatic Sciences, 2(2): 94-102. Download PDF file (242 Kb). Kinas, P. G. & Andrade, H. A. Bayesian statistics for fishery stock assessment and management: a synthesis. Pan-American Journal of Aquatic Sciences, 2(2): 103-112. Download PDF file (150 Kb). Freire, K. M. F., Christensen, V. & Pauly, D. Assessing fishing policies for northeastern Brazil. Pan-American Journal of Aquatic Sciences, 2(2): 113-130. Download PDF file (198 Kb). Andrade, H. A. & Kinas, P. G. Decision analysis on the introduction of a new fishing fleet. Pan-American Journal of Aquatic Sciences, 2(2): 131-148. Download PDF file (428 Kb). 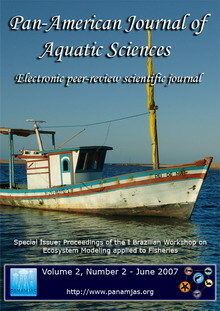 Rocha, G. R. A., Rossi-Wongtschowski, C. L. D. B., Pires-Vanin, A. M. S. & Soares, L. S. H. Trophic models of S�o Sebasti�o Channel and continental shelf systems, SE Brazil. Pan-American Journal of Aquatic Sciences, 2(2): 149-162. Download PDF file (314 Kb). Velasco, G., Ara�jo, J. N., Castello, J. P. & Oddone, M. C. Exploring MSY strategies for elasmobranchs in an ecosystem perspective. Pan-American Journal of Aquatic Sciences, 2(2): 163-178. Download PDF file (157 Kb). Vaz, A. C., Parada, C., Palma, E., Muelbert, J. H. & Campos, E. J. D. Modeling transport and retention of Engraulis anchoita Hubbs & Marini, 1935 (Clupeiformes, Engraulidae) early life stages along the Southwestern Atlantic continental shelf. Pan-American Journal of Aquatic Sciences, 2(2): 179-190. Download PDF file (703 Kb). Ata da reuni�o entre os pesquisadores participantes do �I Workshop Brasileiro sobre Modelagem de Ecossistemas aplicada � Pesca� - March 5th-7th, 2007, IO-USP, S�o Paulo, SP, Brazil. Pan-American Journal of Aquatic Sciences, 2(2). Download PDF file (154 Kb).